Najib is quizzed 6 hours in new 1MDB probe | Daily Express Online, Sabah, Malaysia. PUTRAJAYA: Former Prime Minister Datuk Seri Najib Abdul Razak (pic) was grilled again by the Malaysian Anti-Corruption Commission (MACC) for over six hours following a new probe related to the scandalous 1Malaysia Development Berhad (1MDB) and its dealings with Abu Dhabi's state-owned company International Petroleum Investment Co (IPIC).Najib arrived at the MACC headquarters here at 10am before he met with investigators for the quiz session. At about 4.30pm, he left the commission's federal headquarters. Sources said Najib was called up for investigations for a fresh probe on a payment of more than US$1.2 million (RM5.04 billion) made to the IPIC by 1MDB in a settlement over a US$6.5 billion claim made by the latter. The settlement was made after 1MDB had defaulted the interest payments on two bonds guaranteed by the IPIC in 2012 for the acquisition of two power plants. Prior to today's session, about two weeks ago, he was called up by the commission for questioning on the RM2.6 billion that was found in his personal accounts. He was arrested hours later, held overnight and charged in court the following day on Oct 4. Najib has vehemently denied the funds are from the 1Malaysia Development Berhad (1MDB), insisting the RM2.6 billion which he received in his personal bank account was a political donation from Saudi Prince Abdul Aziz Al-Saud on behalf of Saudi King Abdullah Abdul Aziz in 2011 and 2012 and meant for use for the 13th general elections in 2013. 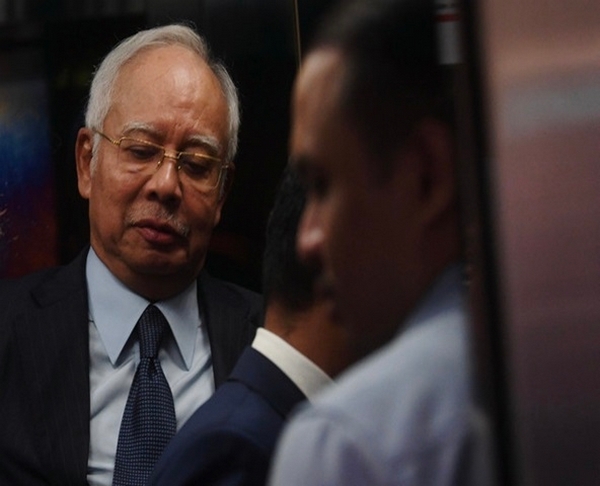 Since July, Najib was arrested thrice on separate occasions and slapped with multiple charges for money laundering and power abuse over the 1MDB scandal and another involving its subsidiary company SRC International Sdn Bhd. He claimed trial on all the charges. The defeat of Barisan Nasional in the 14th General Election spelled trouble for Najib when barely a week after the new government took over the administration of the country, investigations on the multi-billion ringgit scandal were ordered to resume in full scale. Dozens of raids were conducted by the police and MACC including at Najib's house, three condominium units at the Pavilion Residences and other premises linked to the scandal.